Vascular surgery is a surgical subspecialty in which diseases of the vascular system, or arteries, veins and lymphatic circulation, are managed by medical therapy, minimally-invasive catheter procedures, and surgical reconstruction. 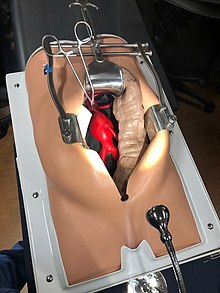 The specialty evolved from general and cardiac surgery as well as minimally invasive techniques pioneered by interventional radiology. The vascular surgeon is trained in the diagnosis and management of diseases affecting all parts of the vascular system except those of the heart and brain. Cardiothoracic surgeons and interventional cardiologists treat diseases of the heart vessels. Vascular surgeons treat extracranial cerebrovascular disease while Neurosurgeons and interventional neuroradiologists treat diseases of the vessels in the brain (e.g., intracranial aneurysms). 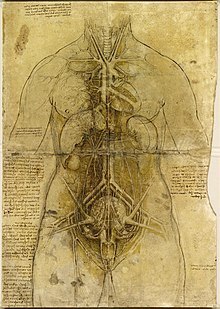 Medical science has advanced significantly since 1507, when Leonardo da Vinci drew this diagram of the internal organs and vascular systems of a woman. ^ "Trusts reveal plans to centralise services after GIRFT review". Health Service Journal. 19 March 2018. Retrieved 13 May 2018. ^ Hooi JD; Kester AD; Stoffers HE; Overdijk MM; van Ree JW; Knottnerus JA (April 2001). "Incidence of and risk factors for asymptomatic peripheral arterial occlusive disease: a longitudinal study". Am J Epidemiol. 153 (7): 666–72. doi:10.1093/aje/153.7.666. PMID 11282794. ^ Ashton HA; Buxton MJ; Day NE; et al. (November 2002). "The Multicentre Aneurysm Screening Study (MASS) into the effect of abdominal aortic aneurysm screening on mortality in men: a randomised controlled trial". Lancet. 360 (9345): 1531–9. doi:10.1016/S0140-6736(02)11522-4. PMID 12443589. ^ "Mortality results for randomised controlled trial of early elective surgery or ultrasonographic surveillance for small abdominal aortic aneurysms. The UK Small Aneurysm Trial Participants". Lancet. 352 (9141): 1649–55. November 1998. doi:10.1016/S0140-6736(98)10137-X. PMID 9853436. ^ Lederle FA; Wilson SE; Johnson GR; et al. (August 1994). "Design of the abdominal aortic Aneurysm Detection and Management Study. ADAM VA Cooperative Study Group". J Vasc Surg. 20 (2): 296–303. PMID 8040955. ^ Thompson JF; Mullee MA; Bell PR; et al. (July 1996). "Intraoperative heparinisation, blood loss and myocardial infarction during aortic aneurysm surgery: a Joint Vascular Research Group study". Eur J Vasc Endovasc Surg. 12 (1): 86–90. doi:10.1016/S1078-5884(96)80281-4. PMID 8696904. This page was last edited on 21 March 2019, at 17:19 (UTC).